Edit spz_settings.cs and set your resolution. 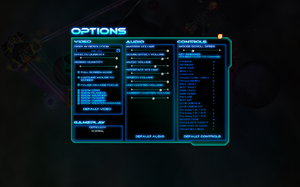 Users with multiple independent monitors (not combined using Surround/Eyefinity) may encounter a black screen of death upon starting the game, where the system can be heard running in the background but video rendering is stuck on the black screen until the user resets the machine. Developer Blorfy created a fix that starts the game in DirectX compatibility mode immediately, bypassing this problem. Place canvas.cs.dso into common/gameScripts inside the SPAZ folder, replacing the file inside. Some users report putting Steam into to offline mode and launching the game will allow normal use. 7 Only when running the game in "DirectX Compatibility Mode".